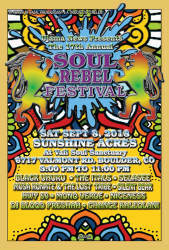 The Soul Rebel Festival is a annual grass roots Reggae, Afro Pop, World, American Roots music festival held in beautiful Boulder, County, Colorado. The festival's mission is to provide cultural harmony, understanding and awareness through the positive medium of music and the arts. The Festival is the manifestation of the creative visionary ideals of Ujama News, an innovative and culturally strong magazine that informs, entertains and educates. Presenting thought provoking, comprehensive information based on the unique Afro Centric heritage,revealed through the arts, dance, literary works, music, natural living and sports. 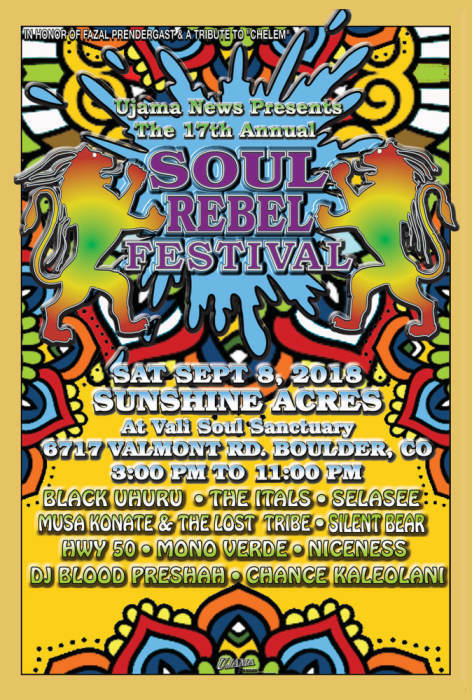 It is in honor Fazal Prendergast-legendary Reggae studio musician and founder of The Yellow Wall Dub Squad, who passed in a fatal car accident on April 1, 2005. And a tribute to "Chelem" Louis Roxburgh, Legendary Jamaican musician and Yellow Wall Dub Squad Bass player who passed on January 25, 2011.